Things are indeed looking good for you! 2015 is coming to a close, and you know what? As early as now, you KNOW you’re gonna own 2016! The signs are clear as day: you’re energetic and raring for the new year to turn over, you’ve achieved your personal goals for 2015, and things, quite simply, are looking good for you. Aside from looking good, you feel good, too: You notice certain things about yourself that give foresight into how 2016 is gonna be your year. Certainly, you can relate to more than a couple of things on the following list. Read on and verify the truth: 2016 is the year you ace life! 1. 2016 looks good because you lost your love handles doing parkour and surfing! Keep this fitness trend going into 2016 and you’re sure to have a healthy new year. Cheers to #balikalindog! 2. 2016 looks good because you'll be celebrating ‘til the break of dawn, you party animal! You've got parties and merrymaking left and right on New Year's Eve, so you're sure to usher in the good vibes for 2016! 3. 2016 looks good because you're no longer a slave to burgers, fries, chips, and other fattening junk food! You’ve learned how to eat better and now you can say no to unhealthy junk food with ease! 4. 2016 looks good because your crush now notices you! There’s hope! Amazing what a few wardrobe changes can do! Keep your style game strong into 2016, sir, and you’re sure to get more than compliments! 5. 2016 looks good because you're gonna be able to share your killer smile with everyone! Quitting smoking in 2015 was the best thing you did for your smile (and health)! 6. 2016 looks good because you've kept no grudges! Walang sama ng loob! That’s because you made the excellent decision to forgive and bury the hatchet—even if some of those people were jerks. 7. 2016 looks good because your doctor is your friend! You two are actually good buddies now! All the regular checkups in 2015 paid off, sir! You’re the picture of health! 8. 2016 looks good because you’ve been so creative lately and everyone says so! Your creativity was stoked this year. Continue it in 2016: learn a new instrument, take a writing class, or start painting! 9. 2016 looks good because you’ve been promoted and got this sweet corner office with a street view! The best place to people watch and to watch the sunset every day! 10. 2016 looks good because you have the face to face it all! You've upgraded your face-care regimen in 2015, and going into the new year, you're primed to have the best face going forward! Can you identify with any of the above signs? If so, then 2016 is definitely looking good for you! How are you personally gonna own 2016 and make it look good? 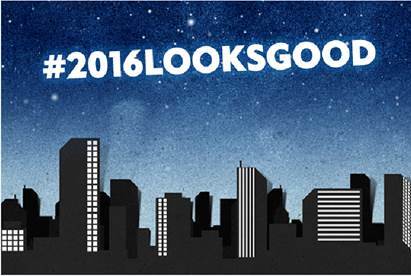 Tweet us at @niveamen_ph and join the conversation by using #2016LooksGood — we want to know what you’ll own in 2016!